The UK has its fair share of horses that are native to this country. Many had a specific purpose but in today’s world, often they take part in leisure activities. This particular breed was bred for the main purpose of racing. Throughout the years, they have been extensively inbred. The pedigrees for every one of them goes back to one of the three foundation stallions. The characteristics of the thoroughbred are usually noted through their colouring. It can be any colour but it must be solid. Although some do have white markings on their faces or legs. 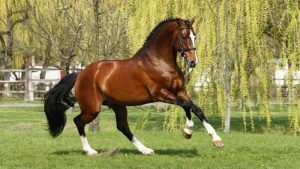 This breed is primarily used for racing as well as pleasure riding and competition. It is a high spirited horse with a great deal of energy. Another horse native to the UK. It came about as the result of crossing the thoroughbreds with Irish Mares. Originally the breed was used for pulling carriages and also for hunting. It was sometimes used for farm work. It is recognized by its long body and a neck that is short but thick. It has a calm nature and is willing to participate in whatever activity it is exposed to. As the name indicates this was a breed of horse used in Suffolk. It was appreciated for its strength which was aptly displayed in pulling events. Also, it was used for farm work. The prominent colour of this horse is chestnut, although the shades will vary. It has a calm nature and is considered to be gentle. Out of all the breeds of horses native to the UK, this breed is the oldest. It is popular as a driving horse. Some breeders like to cross-breed it with the thoroughbreds. When this is done they are excellent for competitions. Their colour is bay.